The Midlands State University Library Services department on Thursday, 25 October 2018 held a one-day e-Resources Workshop to assist researchers and academics with wider sources of reading material through online platforms. The workshop which was held at the Gweru Main Campus was sponsored by ProQuest, the largest single periodical resource available. It brings together complete databases across all major subject areas from business, health and medical, language and literature education, science and technology as well as social sciences. The workshop covered the use of ProQuest e Collection which includes e-journals, ebooks, thesis and dissertation, conference papers, audio and video collections. 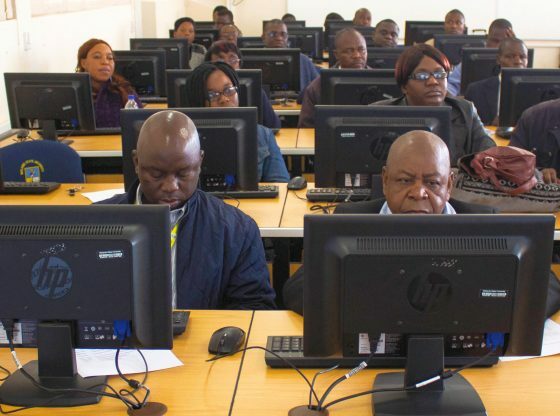 Speaking at the official opening of the workshop, Midlands State University Acting Deputy Librarian Mr Alphege Maisiri said the workshop would provide academics with an opportunity to reflect and see how they have used ProQuest products and services. “This will enable us to see where we have been getting it right and where we have been getting it wrong. I know they are fully armed to impart knowledge and all the necessary skills that will leave us pregnant with information which we will then put to good use in order to meet our research needs,” he said. The ProQuest training workshop targeted participants from all the University’s 9 faculties. Mr Maisiri expressed optimism that the purpose of their visit will soon bear fruit through improved quality and standards of articles published for research. Academics and researchers from various faculties attended the one-day workshop.